Best Pulled Pork Sandwich Ever…and it’s Easy! One of the great all-time euphoric eating experiences is a slow cooked, pulled pork sandwich topped with my grandmother’s amazing Cole Slaw. The best thing about this pork recipe is it’s done in a slow cooker. The prep is really simple, the cooking is low and slow (it can be done overnight), and the resulting flavors are really incredible. What I do is, after it’s cooked and pulled, I divide it up into serving size portions (4-5 oz each), wrap each in plastic wrap and freeze them. 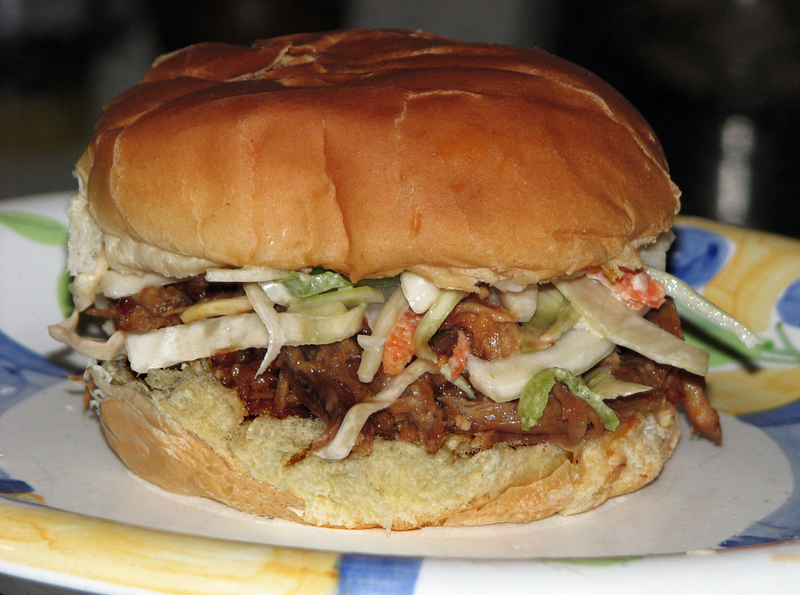 When I get that unmistakable craving for a pulled pork sandwich, I just pop one in the microwave, top it with some bbq sauce, put it in a steamed bun, slap on some cole slaw and, in minutes, I’m in pulled pork nirvana! Click here for Cookhacker’s printable recipe. RIDIC!!! I stumbled onto this website while googling for pulled pork recipes, and I’m glad I clicked in. I can’t speak for anything else on here, but this an AMAZING pulled pork recipe. It’s not difficult at all, and I’ve never had people be more impressed with something I’ve made. People were shocked I didn’t make it in a real deal smoker. I had to forward the recipe to 75% of the people who have tried it, and I’ve cooked this 3 times in the past 3 weeks. If anyone has any questions about it, post them here. I feel like I’m an expert now and I’m happy to share my expertise on this KILLER pork.